Do you usually give the people who provide you with services during the year a gift for the holidays? Many people do. They like to offer a token of holiday cheer to their mail carrier, manicurist, banker, bellman, or other person who often goes out of their way to make their lives better. 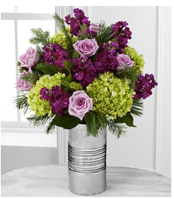 If you’re one of these gift givers and you’ve been wondering what to give this year, why not give the gift of flowers? Flowers have a way of cheering up people who might be down and bringing a smile to the face of those living their lives in a joyful way. We thought about giving flowers away this year, so we made a list of some flowers that seemed like extra special offerings for a special time of year. Poinsettias are longstanding favorite flowers for Christmas. Usually, red is the most popular color for poinsettias, but they look lovely in white, cream, pink, and marbled hues. Poinsettias typically have three to six blooms and come in little pots wrapped in foil paper. You can buy small poinsettias that look cute on desks or larger flowers that make beautiful additions to front porches. 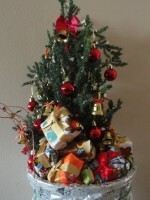 You may have seen mini Christmas trees at the grocery store or garden center that you shop at. They come in many shapes, textures, and sizes, but the common thread that runs through all varieties is that they resemble a full-size Christmas tree. Mini Christmas trees are not the six to eight foot varietals you’d place in your living room. They’re tiny plants, sometimes with flowers, that are more like bushes. We think it’s a fun idea to give a mini Christmas tree to your service provider after you’ve adorned it with little ornaments. If you want to make a festive little arrangement to give to your favorite service provider, consider a vase filled with red Hypericum berries and gorgeous holiday greens. This combination of flowers and leaves can be dressed up with glittery ribbon and other seasonal decorations to offer a gift that your recipient can place on their holiday table at home. These are just a few ideas for holiday flowers to give to the amazing service providers in your life. For something in a more neutral color or holiday theme, you can always opt for dramatic white lilies or irises wrapped in simple brown paper.